Benji awoke and seemed to be in very good spirits after his evening of fever and vomiting. We decided we’d trek out for lunch and after some initial indecision, Ogre made the command decision to try Boston Market (which Mina used to think was Steak and Shake because they both have the black and white stripes). Sure, I said and we all headed over. After I told Ogre what I wanted and we picked out food for the kids, I headed to find a table with Benji. 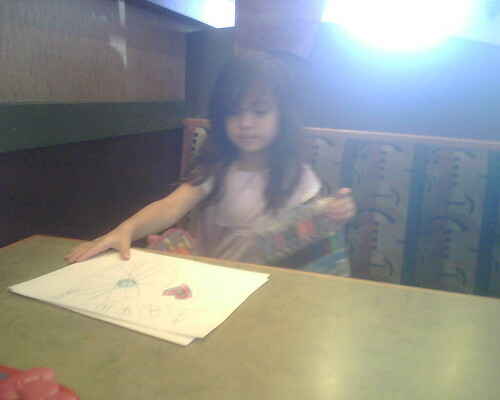 We got settled in and Mina opened up her backpack of goodies. 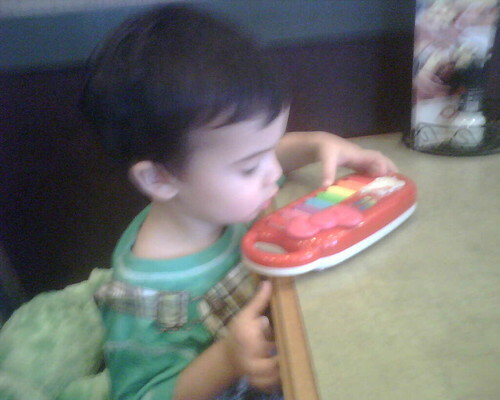 Meanwhile, Benji played on Mina’s Hello Kitty “pee-lano” that he brought with him. Ogre brought over both trays of food, and then went and got drinks. Turned out, Mina and Benji wouldn’t need anything to keep busy as we were ready to dive in. 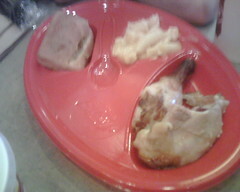 I went ahead and cut up some chicken for Benji and we gave him a little macaroni and cheese and stuffing. Mina wanted a spoon to put in the spoon slot of her tray, but I compromised with putting ketchup in there for her. We all dug in. Benji only had a couple bites of food, but I figured that his body would tell him how much to eat, so we did not push. Mina ate exceptionally well. The girl likes her chicken! It took a little longer for me to eat for some reason, so Ogre brushed Mina’s hair while I finished eating. Then I found Benji trying to push me out of the way to get out. I figured he was just trying to get out and tried to block him, but he said, “Benji brush hair, too.” Okay. So, Ogre brushed his hair also and told Benji how handsome he looked and how much he looked like Papa. That’s debatable…the looking like Papa part, I think my Benji looks like me! Simple meats and sides. They have salads and sandwiches also. 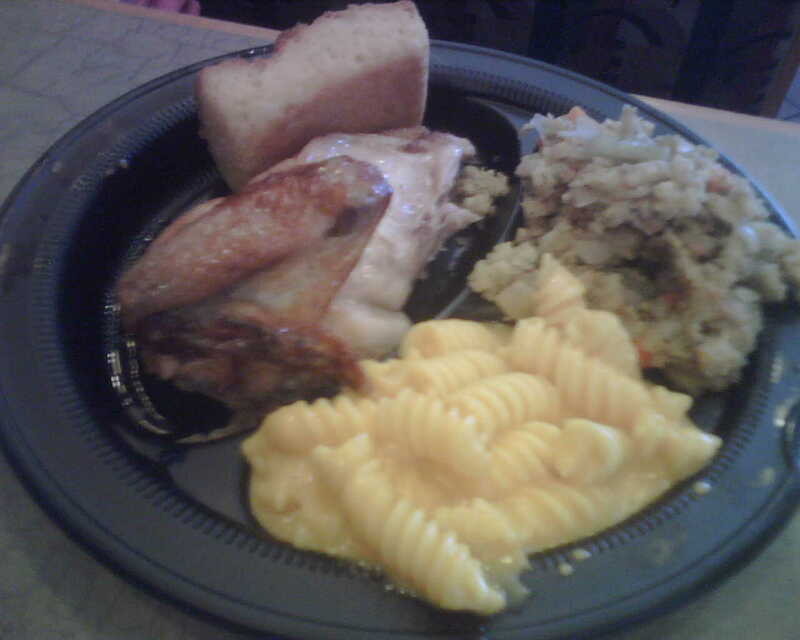 We all had the rotisserie chicken with some amount of sides. 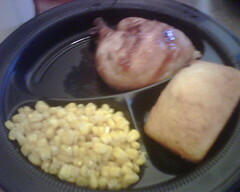 The chicken was very good; nice and juicy and had good flavor. It was a little on the saltier side from the seasoning, which Ogre thought of as a plus, but I thought a little bit of a negative. We had for sides: the macaroni and cheese, which was good; the stuffing, which was good, and the corn, which was not great, but not bad. Everything was pretty average. They have some kids menu choices. Since it’s counter service and you leave with what you order from the counter there is no need for kids activities to busy the kids since there’s no wait. I think it’s fine for a quick full meal, but don’t expect any greatness!